And I mean really ride it? I'm trying to find my first Fat and I'm not so interested in the craftsmanship (ie, I won't buying to restore it), but I've always heard the ride is legendary. I'd like to get one and really ride it on single-track - not convert it into a commuter or anything scaled down from its original purpose. What should I expect if I got a late 80s/early 90s model? Is it going to be like an older car that, good as it rides, you're terrified it is going to break down and cost an arm and a leg to fix? I have no issues taking care of a bike, even an older one, but I figure I ought to find out what I'm getting myself into. Any insight, of course, appreciated! I "collect" vintage mountain bikes, but I use the term lightly because, unlike a lot of collectors, I buy then with the intent to ride them to the limits of my skill. In my short time here on Fatcogs, I've gathered that more Fat collectors seem to feel the same way compared to collectors of most other vintage brands. It's become one of the reasons I like them so much. First off, you should appreciate the craftsmanship. It's a big part of what makes the bikes so capable. 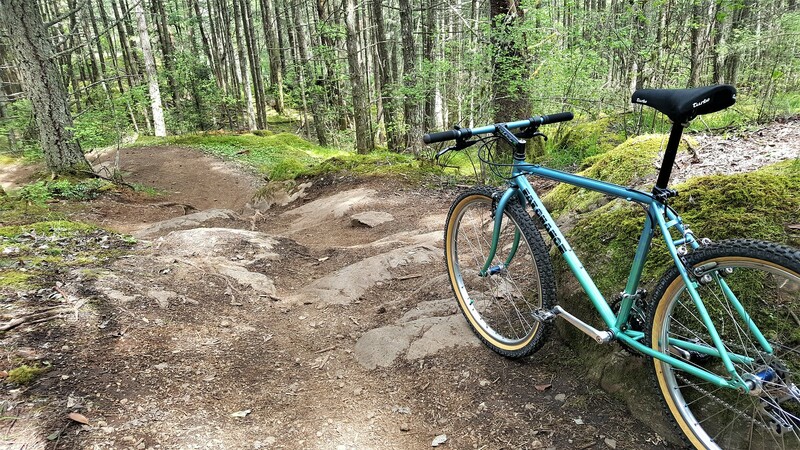 If single track is your environment of choice, I can't recommend anything better than a Yo Eddy. They totally rip through the technical trails, while still maintaining perfect composure on demanding climbs. An early 90's Yo would be a fantastic choice, but if you want my top pick, I'd say look for a later New York built Yo with a 1-1/8" headtube. Those were produced from the end of 1996 on. Many riders, myself included, like the pinpoint accuracy of the rigid fork Fat City offered, but a Marzocchi or Fox suspension fork will still compliment the bike nicely. Modern day bike mechanics aren't well versed in old technology and largely subscribe to the philosophy of replace rather than repair. Modern day bike shops would rather sell you a new bike than accept the relevance of your old one. Consumers, in general, have come to accept the ridiculous idea of planned obsolescence. Cyclists, by and large, seem to feel that they can't have fun on a bike unless it's got all the same feature that the pros' bikes have. These factors all feed off of each other to form the mass market opinion that old bikes are silly and new bikes are what you want. I suppose I should end my rant there, but the takeaway is buy an old Fat Chance, let us help with any problems you may have, and enjoy the ride. I think that the older bikes are quite ride-able, although for rides that are really long or technical, I grab my FS 29er. The really early bikes had slacker angles, which I find less fun to push hard in singletrack. Good one inch suspension forks can be tough to find, so a rigid fork is a good thing to find on those bikes. If you are accustomed to riding disc brakes, canti or v-brakes might take some getting used to, but they have worked OK for a long time. Awesome replies, both of you. I'm no expert, but I've spent enough time on a bike to appreciate the ride. I'll take the advice into consideration moving forward! I'd love to find a Yo in that era, but finding one for sale AND within my budget (can't break the bank for my first one) may prove difficult. Thanks! Look for a wicked: they are half the price of a Yo Eddy and it was a classic, best of, in the late 80s. Some even prefer the wicked to the Yo. Anyway: buy both. What's interesting is I have ridden many other high end brand bikes with similar geometry and tubing spec to the FATs of the late 80s/early 90s era but there is NO comparison in terms of build quality and more importantly 'the ride'. It's the FATs that you just want to take out everytime. I ride two of mine regularly. I don't own modern. I have tried a few high end ones but they have no soul and you can barely feel the CX trail beneath you. Good advice. The Wicked is my favorite model, but they do not get the respect afforded the Yo, so prices are much lower. If you can find a Wicked Lite, all the better. Pretty sure it's an 18inch though not a 19.5in as stated. The head tube TT/Downtube gap is too small for 19.5in. If it suits it will be a hell of a bike to ride. actually.. seat tube looks longer than the 18in... Curious. One of a kind? I would ask the seller to measure everything. It's possible it's a late version or a custom build and they changed the geo for more suspension travel, hence a 'tighter gap' as mentioned above but I looked at virtually every Wicked lite in 18/19.5in on the web in the past and the 18in were almost fused at the headtube with a sloping top tub, as this appears to have. The purple WL is 100% an 18in. It's a bad angle but 'that gap' is noticeably narrower and the TT slopes like the one on eBay. The black WL is 100% a 19.5in. I have two 19.5in TC with the same geo and horizontal TT too but some early 93 WLs were not sus corrected hence the curiosity. Getting the serial no will help. WL in 19.5in in grey for reference. Shh I'm watching that one! Keep it rolling, guys! I'm eating it all up - great stuff! Good luck bidding if you win and prep it before riding some twisties...it's guaranteed you will have a huge grin on your face. Then you will 'GET FATs' and their telepathic handling That paint is so puuuurty too. I've got an 18in wicked lite.. It disappears under you. My other bike is an Ibis Mojo so my standards of comparison are pretty high. I have a 96 Yo Eddy that I ride fairly often, probably around 400 miles a year. Actually a couple years ago I did every XC race of the season on it. If you count short track xc races it saw probably 15 races that year, I managed to win 2 and podium 11. Awesome !! Seen a few threads around, seems there are more than a few people who still win races these days on their 20+ year old FATs. Somehow that doesn't surprise me. I've been into and old Fats for nearly 30 years. If you want to win non-vintage races, you should buy a new bike. That said, a very lightly used 6spd or 7spd Shimano drive-trained bike with a rigid fork you could take alone across Africa tomorrow - as fast as your heart and lungs will lungs will allow - with fresh rubber, a few spare tubes and a set of brake pads. I think you'd nuts to try the same on a carbon FS 650b wonderbike without tech-support following. If you want to ride fast, get a road bike. Fat tires are slow no matter how much technology you have under the roof. I use my 1994 Yo eddy 2-3 times a week, have owned since 1997, it's a wonderful bike, and here in Sweden it's very rare, and I often get great comments from other cyclists..
After a bad DH crash in '98, I had a spinal cord injury, which went undiagnosed until a decade later when it blew up in another crash, and since then, the most I ride at all anymore is cruising around town & occasional social rides. At first I thought I'd just get a crummy cruiser for that, but then realized, if all I can do is ride around town, it's going to be on my favorite bikes, and I'm damn well going to enjoy them as much as I can. So I keep on buying them and trying different ones out. It's a cheap hobby compared to owning a plane or boat. I ride mine but very rarely on a trail. In fact I just had it powder coated to be like when I bought it from Mountain Bike Specialists in 1986. Pretty sure it is a Kicker or Kicker Comp. It is aa great ride and now great to look at also. I still ride my 93 Monster Fat on concrete/gravel bike trails. I ride my 95 Yo! just about every night after work for at least 45 minutes. It's basically just a tar & gravel bike these days, but a damn fun one. Yes, every single one I've owned. I rode my wicked as my only bike while living near the desert in Mexico. 3 to 4 hr rides were pretty common. I also rode on east coast like trails in Rio de Janeiro which are technical and steep. Fat Chances are tough bikes while being very balanced on technical terrain. They are nimble bikes and some prefer other brands for riding on fast rolling terrain. When it´s rocky and steep, narrow and rutted, i can´t think of a better bike to be than a wicked or a Yo Eddy. I ride my 92 Slim chance 15-30 miles a day during the week, commuting to work and riding around for work. Built up with ultegra 6800. Great, stiff, fast bike. It transmits all road shock unlike my Spectrum Ti, which in NYC is a little rough! I rode my recently sold 91 slim chance mostly on the weekends touring around the county roads in NJ/PA. I had a Yo! that I used on local single track, but have to say I prefer the old merlin ti for it's ability to soak up the bumps....and have since moved on to a more modern full suspension bike for all mountain biking. Getting old. All the time mostly roads now though as suspension treats an old guy better on the trail although the box crown fork does spring. My cassette seems to get bigger and bigger. I don't really ride mine all that much. I have to get back into the habit again. I try to ride all my Fats as much as possible - which sadly isn't much at all due to the very limited time I have. The bikes rides like a dream and it's very much recommended to set them free once in a while. It's not worse to replace something here than on a modern bike, everything is always possible to find - sometimes with a bit of a patience. They all ride lovely, although there is a very big difference between the earlier ones and the more "modern" (I see my 93 Yo as new ). The 83 Fat Chance is a real pocket rocket and is clearly a very box-inspired ride. A Fat was built to be ridden!